Spray foam insulation can be a valuable tool to homeowners because of its energy efficiency which can help increase a home's comfort and value. In addition, having spray foam installed in the basement joints may even qualify some homeowners for a Federal Tax Credit. Most homeowners are looking for ways to save money on energy expenses while also increasing their home's comfort. This can be difficult as old and brand new homes can both have drafts due to insufficient home insulation. Often there is too little insulation installed in the home, but it can also be the result of improper home insulation installation. Adding spray foam to your crawl space's rim joists can help seal air from entering and exiting your home, making it more comfortable for you and your family. 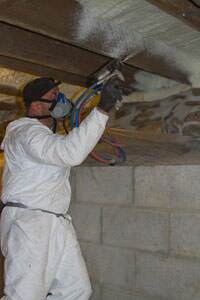 Contact CleanSpace Northwest today for a Free Estimate for crawl space joist spray foam insulation. Before spray foam was used, there was fiberglass insulation. Unfortunately, fiberglass is still being used in homes, wasting energy in the home, and even becoming mold-infested material, over time. While an unsuspecting homeowner may believe this kind of insulation will better seal the home, it doesn't create an unbroken insular sheet on your walls. 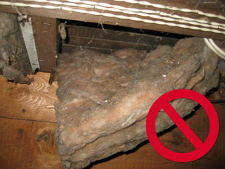 Instead, fiberglass insulation can get damp and moldy from being in a damp, unhumidified, basement environment. While fiberglass insulation wastes energy in your home, spray foam insulation expands against your basement's rim joist, sealing off small holes that fiberglass insulation may not close. Spray foam is also mold-resistant and prevents water and condensation from pooling up, whereas other insulation types may permit mold growth and moisture problems. By keeping the warm air inside during the winter and the hot air outside during the summer, spray foam insulation can make for a more comfortable home, while saving energy from overusing heating and cooling systems. By using spray foam insulation instead of fiberglass insulation, you'll leave the sagging, pink, fluffy mess behind, because spray foam insulation is permanent and will not sag. This kind of durability can also prevent rodents, and bugs from entering the home. 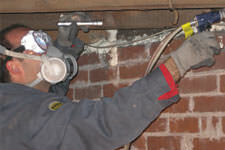 Spray foam can be used in many residential, commercial, and industrial applications. To learn more about how crawl space joist spray foam insulation can improve the value of your home, we're the contractors for you. CleanSpace Northwest offer free written spray foam basement joist insulation quotes to homeowners throughout the Bremerton, Olympia, Silverdale, Port Townsend, Shelton, Belfair, Gig Harbor, Hoquiam, Chehalis, Kingston nearby areas such as Bainbridge Island, Port Angeles, Centralia, Aberdeen, Port Orchard, Rochester, Poulsbo and the surrounding locales.